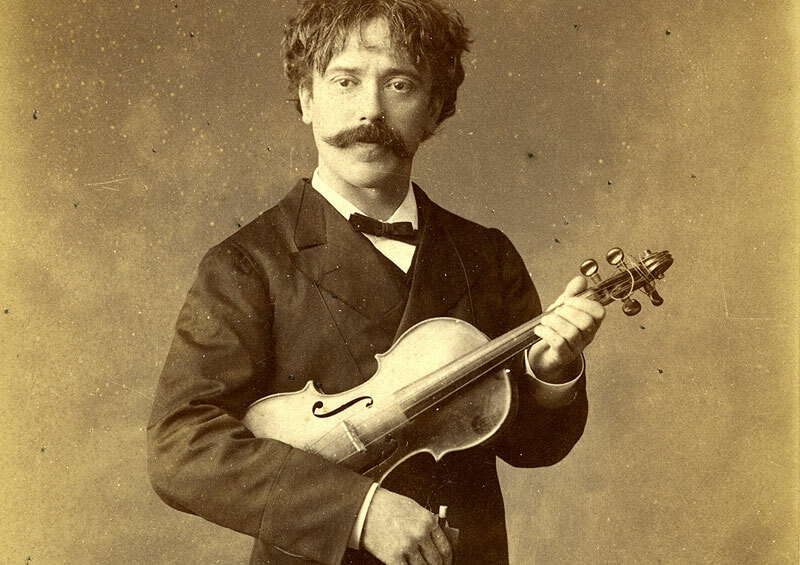 Pablo Sarasate was born 10 March 1844 in Pamplona, Navarre, the son of an artillery bandmaster. He began studying the violin with his father at the age of five and later took lessons from a local teacher. His musical talent became evident early on and he appeared in his first public concert in A Coruña at the age of eight. His performance was well-received, and caught the attention of a wealthy patron who provided the funding for Sarasate to study under Manuel Rodríguez Saez in Madrid, where he gained the favor of Queen Isabella II. Later, as his abilities developed, he was sent to study under Jean-Delphin Alard at the Paris Conservatoire at the age of twelve. Sarasate, who had been publicly performing since childhood, made his Paris debut as a concert violinist in 1860, and played in London the following year. Over the course of his career, he toured many parts of the world, performing in Europe, North America, and South America. His artistic pre-eminence was due principally to the purity of his tone, which was free from any tendency towards the sentimental or rhapsodic, and to that impressive facility of execution that made him a virtuoso. In his early career, Sarasate performed mainly opera fantasies, most notably the Carmen Fantasy, and various other pieces that he had composed. The popularity of Sarasate’s Spanish flavour in his compositions is reflected in the work of his contemporaries. For example, the influences of Spanish music can be heard in such notable works as Édouard Lalo’s Symphonie Espagnole which was dedicated to Sarasate; Georges Bizet’s Carmen; and Camille Saint-Saëns’ Introduction and Rondo Capriccioso, written expressly for Sarasate and dedicated to him. Of Sarasate’s idiomatic writing for his instrument, the playwright and music critic George Bernard Shaw once declared that though there were many composers of music for the violin, there were but few composers of violin music. Of Sarasate’s talents as performer and composer, Shaw said that he „left criticism gasping miles behind him“. Sarasate’s own compositions are mainly show-pieces designed to demonstrate his exemplary technique. Perhaps the best known of his works is Zigeunerweisen (1878), a work for violin and orchestra. Another piece, the Carmen Fantasy (1883), also for violin and orchestra, makes use of themes from Georges Bizet’s opera Carmen. Probably his most performed encores are his two books of Spanish dances, brief pieces designed to please the listener’s ear and show off the performer’s talent. He also made arrangements of a number of other composers’ work for violin, and composed sets of variations on „potpourris“ drawn from operas familiar to his audiences, such as his Fantasia on La forza del destino (his Opus 1), his „Souvenirs of Faust“, or his variations on themes from Die Zauberflöte. In 1904 he made a small number of recordings. In all his travels Sarasate returned to Pamplona each year for the San Fermín festival. Following recording Zigeunerweisen is performed by Chrissie Telma Guðmundsdóttir (violin) and The Iceland Amateur Symphony Orchestra directed by Oliver Kentish. This was recorded at Seltjarnarnes Church 16th of October 2016. Thanks to Oliver and Chrissie who gave me a permission to publish this recording on the web. Mics: Neumann KM184 (NOS) & Line Audio OM1 (AB40) in 3m above orchestra. Sennheiser MKH20 for bass and Line Audio CM3 on soloist (Chrissie).